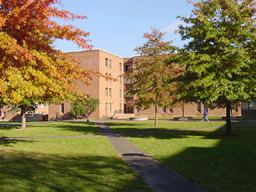 Nugent is first year residence hall that borders a courtyard designed for frisbee, football, and outdoor relaxation. Rooms have either private or semi-private baths and are air cooled. Each of the four floors includes a lounge and a study space. First floors feature a kitchenette and large lounge. All double rooms have a privacy wall in the center of the room. This privacy wall is not shown in the floor plans. On the first floor of Nugent Hall is Ground Zero, a performance art thematic community for upperclass students. Ground Zero hosts events and concerts in the basement of Nugent Hall.